This yoga teacher training helped me breakthrough many physical, mental, and emotional scars and injuries that I thought would plague me forever. It was, literally, the most fruitful, engaging and beautiful experience of my entire life. Each of the three [advanced yoga training] modules was incredible. The instructors were a true inspiration and offered expert caring guidance as I learned and explored. As in the 200-hour, in each module of the 300-hour, I feel as though I learned vast and incredible things from the teachers and the presented material, and also was able to explore what knowledge bubbled up from inside of myself. I was excited, challenged, delighted, and made a richer and more thoughtful yoga teacher through each training. More importantly, this knowledge is a part of my human as I navigate the world more thoughtfully. PYC has enriched my life in so many ways. I am grateful for the jungle, the fellow students, the nourishing food, the incredible vista, and countless memories held dear. It is a home, a heart, a piece of my life. PYC is a refuge, a lookout, and an incredible nest for the body, the mind, and the soul. I am so grateful I embarked on this adventure, this pilgrimage, this incredible practice of yoga. Although I have been incredibly fortunate in my education -- I would rate my experience at PYC as truly remarkable. I would recommend PYC to anyone wishing to explore truly what it means to be alive on this planet. This place is not just for crazy contortionists. Even if you are just wanting to learn and not a super yogi, trust that this is a welcoming environment for all levels. You chose to challenge yourself or take a child's pose when you need it. Take the leap and go! 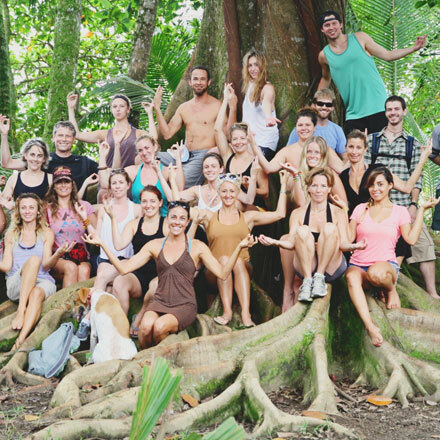 This yoga teacher training was an experience to truly be so grateful and thankful for.... I have a new concept of love in a completely different way. My journey towards......ME!!!! And for this I want to thank you again and again. Indira clearly has put a lot of time and energy into creating a yoga teacher training program that allows you to completely let yoga into your life. I cannot wait to return to Pavones Yoga Center to learn more about yoga, but also to a space that effortlessly lends itself to self-exploration and focus on the present moment. The yoga teacher training at Pavones Yoga Center really taught us to live in the moment instead of dwelling on the class coming up, because it's a mystery school. The environment and Eco influence Indira uses in her training is awesome as well and I think is a main factor that sets her apart from other trainings. If you care about all life and the connection of all living things you will love this training. They really have it down at Pavones Yoga Center! I can not wait to go back! I really could not be more pleased with my decision to take my yoga teacher training there. Even with programs all over the globe: You will not be disappointed here!! We spent time working on flow yoga classes, yin, restorative yoga, human anatomy, teaching different age groups, ethics and philosophy, meditation and the nature of consciousness, the history of yoga and the first yoga sutras, intention setting…. By the end of the yoga teacher training program, you will feel ready to teach a yoga class- we were all in agreement about that. I was really rocked by this experience (in a good and meaningful way). You will not regret this program. The curriculum that is taught at Pavones Yoga Center is so much more than yoga. I learned so much about myself and life while being there. You can truly feel the amount of love and passion Indira has for teaching yoga. I can not wait to return back to Pavones Yoga Center for future yoga teacher trainings. The multidimensional yoga teacher training was incredibly thought out and planned down to the last details. The program is taught by Indira and a wonderful roster of teachers from all over the world who bestowed a plethora of their knowledge on each and every student over the course of the month. This yoga teacher training goes above and beyond giving graduates the tools to becoming amazing yoga teachers and the confidence to bring their own individuality to their class and practice. During my time at Pavones Yoga Center I had a life changing experience. The staff at Pavones Yoga Center created a program that exceeded any expectation I had going into the program. I learned so much from them and they made the trip one that I could only dream of. The yoga teacher training at Pavones Yoga Center is thorough and inspirational- nothing that happens isn't part of a lesson plan. 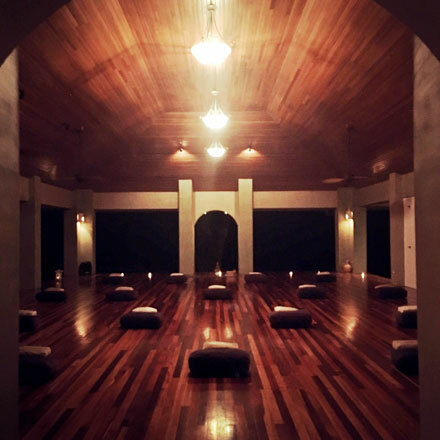 You will experience a wonderful feeling of peaceful ease and relaxation from PYC and learn so very much! This place is pure magic! I’m endlessly grateful that I had the chance to study and teach yoga in this surrounding and with these amazing students and teachers. The experience at PYC put me on a path that I couldn’t be happier about being on right now. The insights I gained during my trainings at PYC gave me the tools I needed to be able to work with what I love. I can’t wait to go back and learn more. Life changing experience. When I decided to start my yoga journey at PYC, I had no idea just how deeply moving this experience would be. I made life-long soul-full, meaningful friendships. I connected to nature more deeply than ever. I grew more than I ever thought possible. BEing and practicing at PYC is more than just physical. This experience touched way deeper than that. Indira is so passionate about the continuous studies of yoga. She pours her heart and soul into this sacred space. Her teaching is authentic, her words kind and well thought out. Her continuous self study is inspiring and always being put into context for her trainings. The facility is absolutely beautiful. Exquisite views of the Golfo Dulce. If you are a surfer, perfect spot to check out the swell coming in. Wave after wave after wave rolling in on one of the longest left point breaks in the world. Fall asleep and wake up to the magical sounds of the jungle. Spot a mysterious blue Morpho butterfly flutter through during your morning practice. Check out the monkeys and macaws during the mid day session. Unwind to the sound of the waves crashing during the night session. Hang around in the hammocks, and let the sweet smell of the ginger flower breeze across your face. In between all of this..... nourish your body with the purest, freshest ingredients Costa Rica has to offer. I'm a sweet tooth and I am never sure what is better, the savory meals or the rich deserts Alex always has cooking up. When you're not deep in explorative study or licking your plate for seconds, head down to the most magical beaches Pavones had to offer. If you are lucky, you will find yourself one of the treasured heart rocks scattered across the shore. Immerse yourself in the culture as you meet the sweet people of the town. As you can see I absolutely LOVE this place and would be more than happy to answer any questions if you find yourself interested in this opportunity of a lifetime!!! My time at Pavones Yoga Center was truly life changing in many ways. The opportunity I had to deepen my practice was amazing. Indira and the others leading the teacher trainings offered amazing classes that encouraged self-discovery. Practicing in a setting surrounded by nature in an open air studio was incredible and enhanced the experience. The month I spent at PYC gave me a strong foundation for my own teaching journey. The multi-disciplinary approach was something I was searching for and has given me incredible versatility in my own teaching. I have been able to take the lessons I learned to develop a full time career as a yoga teacher. My business focuses on sport-specific yoga, but I also teach several different populations and am developing programs for those who are challenged with mental health issues. PYC was also the place that allowed me to develop my voice as an advocate for mental health. PYC was the first place that I felt comfortable telling anyone other than close family and friends about my challenges with Bipolar II Disorder. I had always wanted to be an advocate, but PYC was the first place that I was able to use my voice publicly. I now do community talks on a regular basis, write articles for several different outlets and perform stand up comedy centred around mental illness with the goal of destroying stigma. During my time at PYC I developed many friendships that are extremely important to me and I am sure will be ones that last a lifetime. If you are looking for a place to train as a teacher or deepen your practice PYC is the perfect place to do just that. ...going to Pavones Yoga Center was one of the best decisions that I have ever made. It was so much more than learning poses and cues, but incorporated some much needed tools to help fully accept myself, which is extremely important for a yoga teacher. Indira and her amazing staff helped show what the yogic lifestyle really embodies in a passionate and safe setting. The creation of space, and all the details put into the program, really provided a safe and loving environment which was easy to learn and teach in. Not to mention the fact that it is set in the ideal surroundings with both jungle and beach at your fingertips. The 200-hour teacher training is designed as a Mystery school, but make no mistake, every single element around the training has been designed fully with intention. Indira's ability to connect to the human psyche and craft an experience that both nurtures, and gives you the tools to tap into your truest self is unparalleled to anything I have ever experienced. The teacher training far exceeded any expectations or hopes I may have previously had for a YTT. The program's immersion and study of ecopsychology and the local, wild ecosystem is something I will carry in my heart always. I left the training with a feeling of confidence and preparedness to continue to follow the path of my own inner light, and the courage to offer that light to others - yet no matter where that path takes me, I know I will always feel a sense of home at PYC. Pavones Yoga Center will change the way you think, the way you explore, and the way that you live. Indira beautifully mixes instruction with guidance to create an environment more conducive to learning than anything I have experienced before. The assistant teachers are as wonderful and the training has allowed me to grow in the most incredible ways. Pavones has stolen a piece of my heart. I will return here again for more training. The environment and the atmosphere are beautiful and my heart and mind are in bliss after training with Indira for a month. I continue to tell people that other than the birth of my children, my time down in Pavones [for the 200-hour yoga teacher training] was the most amazing experiences of my life. Not only is Indira excellent at her craft, she is an excellent teacher. Yoga classes, theory classes, rituals, group trust - it's all brilliantly designed. Indira is magisterial- very wise and open; she's “present" and invested in her teaching. She is an important role-model for me. Although influenced by the Iyengar tradition, the training is its own "multidimensional" style, which I loved. Indira is an authentic and kind teacher of all aspects of yoga: physical emotional mental and spiritual. The structure and environment helped me to observe all of the range of my experience with much more curiosity and kindness than I have before. This was only possible through the systematic and intentional way that Indira designed and sequenced every detail of the program. Gosh, it was just so smart, so whole-hearted, and so real. Indira did such a wonderful job at making everything we learned so fun and interesting. The daily yoga practices, the lectures, the group activities… Words cannot do it justice. Indira is one of the most intelligent women I've ever met and has such a great way of teaching her students by making it interesting and fun, and still keeping it very disciplined. Indira, thank you for opening your home and your heart to us. For reminding us of the beauty of the natural world, and our place in it. Thank you for creating a safe space for us to grow. You are so knowledgeable in teaching asana, you could have created the entire program around that foundation. Instead, you offered us such a bigger gift. Rather than becoming masters of only asana, you taught us to become masters of ourselves and how to live in that inquiry…while still being eloquent, confident teachers of yoga. We came to you as little caterpillars. Hungry for knowledge, for growth, for a change, for a different perspective. You helped us to build our cocoons by providing safe space, inspiring community, sharing from the bottom of your heart what you have found to be your deepest truths. Now, we are breaking free from the chrysalis. We have transformed into beautiful butterflies. We now fly freely, bountiful in knowledge of self, building community, and yoga as a lifestyle. In this crazy world, you can rest easy, knowing that you have changed and inspired the lives of 10 individuals, and taught us how to pay it forward to those we meet or teach. We came for a yoga teacher training, but we received so much more. We offer our practice to you tonight as a blessing. Thank you for blessing us, by offering your dharma with peaceful determination, beauty and grace. I wish everyone would open themselves up and make the journey to the beautiful Pavones Yoga Center. I feel so changed by being there. The rooms were comfortable and the food was great! The ocean and jungle views are just breath taking. Right outside of my front door I had the view of the jungle and often times I could just sit on my balcony and watch monkeys. Inside of my room I had the most incredible ocean view out of my window. I've traveled to 32 countries and I've never seen a more beautiful space. Could this possibly get any better? Could this place be any more beautiful? How did I get so lucky to be here? Could I ever express my enormous gratitude for all of this? 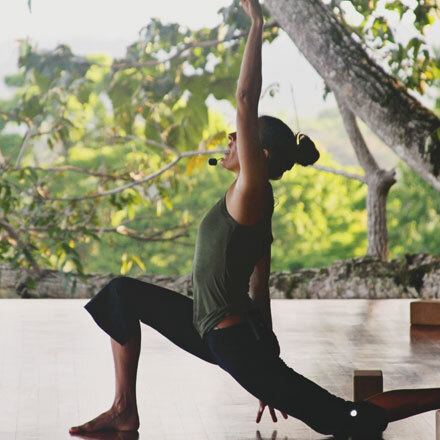 The yoga studio itself occupies an elevated space with a 360 degree panoramic view of the beach and Golfo Dulce, and the jungle, where howler monkeys and sloths abound. The studio is clean and beautiful, and especially memorable during evening sessions, when tropical storms can be seen, heard, and felt. The rooms are simple, comfortable, and clean, and decorated with original art on the walls. Pavones Yoga Center reminds you of what the world once was with a interconnectedness to your surroundings that is forgotten in our modern day world. It refreshes your approach to life beginning with breathing, & moving through the more challenging aspects like self love & acceptance, failure & successes, listening & REALLY listening... I plan to return as soon as possible but remain there in my heart everyday. The accommodations are beautiful. You can observe monkeys, sloths, and many types of exotic birds from the balcony of the yoga house. The beauty and serenity of the yoga pavilion cannot be matched! Waking up to practice yoga every day in this paradise felt like a dream. I will go back for more yoga teacher training the first chance I get! Pavones Yoga Center has the most tranquil and beautiful views of the ocean while still being secluded by the lush Costa Rican jungle. The staff was kind and very helpful. The accommodations were very modern and always tidy. …sweeping views of Gulfo Dulce, whales that can be seen from the house and yoga pavilion. I loved waking up and watching the world come alive from the balcony off the kitchen, and I've seen some of the most amazing sunsets of my life from there. To be woken up by howler monkeys, and then to hear toucans and macaws all day... watching the blue morpho butterflies go by, it really is enchanting. It’s great to know there are really special places like this in the world! The food nourishes the body and soul. I was nervous about not eating meat for a month but after a couple meals I completely forgot I wasn't having any meat because the meals were so tasty and filling. The food was stellar and a major selling point of this particular program. Vegetarian. …A culinary treat at each meal. The food was incredible and nutritious there was always a variety of items to choose from…. 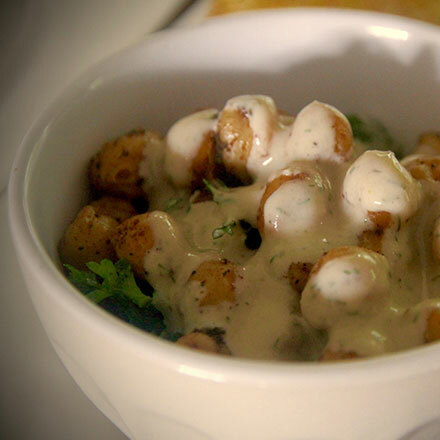 Vegetarian meals prepared by Alex are delicious and nourishing. I brought home so many new recipes – ones that I actually use!